When the team members at Penn Community Bank say we are committed to our communities, we mean it. 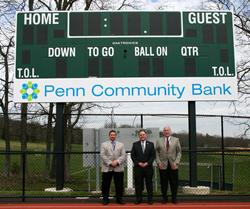 Anyone attending a spring track meet or a fall football game at Pennridge High School’s Helman Field will notice a fresh addition to the field’s scoreboard: the new logo of Penn Community Bank, Bucks County’s leading independent, mutual financial organization. Penn Community Bank is sponsoring the scoreboard, fulfilling a commitment made by one of its two predecessor banks, First Savings Bank of Perkasie, last year. A wrap bearing the bank’s logo recently was installed on the scoreboard so that the display would be ready for spring sporting events. Todd Hurley, Penn Community Bank’s Chief Relationship Officer and Executive Director of the Penn Community Foundation, recently joined Pennridge school district officials Dr. Troy Price and Dr. Bruce Bovard to mark the sign’s installation. Price is Director of Administration and the cabinet member who leads Pennridge’s Rams on the Ridge fundraising campaign, while Bovard, who has retired as the district’s assistant superintendent, was in charge of the fundraising effort when the bank originally committed to the sponsorship. A veteran employee of what is now Penn Community Bank, Hurley also is a longtime resident of Perkasie and a graduate of Pennridge High School, class of 1983. One year later, he started working at First Savings Bank of Perkasie and returned to work there after graduating from Shippensburg University. Formed in 2015 by the unification of First Savings and First Federal of Bucks County, Penn Community Bank is Bucks County’s leading independent, mutual financial organization. On May 1, 2016 the bank appointed Hurley to head its newly launched Penn Community Foundation, representing the bank to the community and the organizations it supports through volunteerism and with financial donations. Penn Community Bank has pledged to donate up to 5 percent of its net earnings to charity, and has been recognized by publications, including the Philadelphia Business Journal, for its corporate giving programs. As one of its first official acts, the Penn Community Foundation donated $40,000 to the Pennridge School District for the scoreboard sponsorship opportunity. To learn more, visit PennCommunityBank.com. PHOTO CAPTION: Todd Hurley (center), Penn Community Bank’s Chief Relationship Officer and Executive Director of the Penn Community Foundation, joined Pennridge School District officials Dr. Troy Price, (left), and Dr. Bruce Bovard, (right), to mark installation of Penn Community Bank’s logo on the scoreboard at Pennridge High School’s Helman Field, part of the bank’s sponsorship of the school district. About Penn Community Bank: Created in 2015 by the unification of long-standing community banks First Federal of Bucks County and First Savings Bank of Perkasie, Penn Community Bank holds more than $1.8 billion in assets and employs more than 300 people at 22 bank branches and two administrative centers throughout Bucks County. As an independent, mutual financial institution, Penn Community Bank is not publicly traded and operates with its long-term mission in mind: to help businesses grow and prosper, to support individuals and families throughout their lifetimes, to strengthen the local economy, and to partner with local organizations to act as a catalyst for positive growth in every market it serves.